You can read the full recipe on Food & Wine's website, but basically it came down to a few easy steps for the spread and the taco ingredients. (from our garden) were smoky and sweet. The only problem we encountered with the recipe was getting the ancho chiles. We looked at three grocery stores and couldn't find them. I should have looked at one of the ethnic groceries in town, but I didn't. We substituted fresh poblano peppers, some chipotle powder and a touch of oil. The spread turned out great, but next time I will use the ancho chiles. 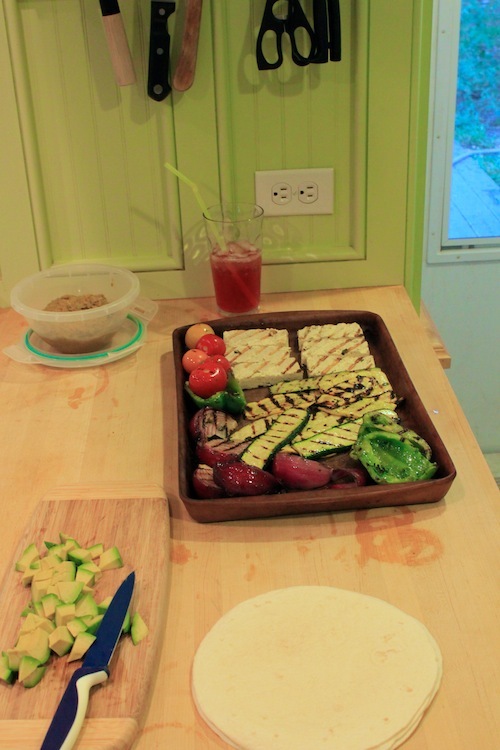 Once we grilled everything, we brought it inside, heated our tortillas and made some tacos. We decided to add some avocado, which was a good call, and later thought that some fresh cilantro would brighten up the dish quite well. My one complaint about the recipe is that it calls for flour tortillas. I prefer corn, which are less durable, but the flour ones were fine. I think I'm going to stop by a tortilleria for fresh corn tortillas next time I make this. The tacos were great. All of the veggies and the tofu took on enough flavor from the wine, oil and herb marinade to give them a little zip, and the tomatoes brought a lot of smoky sweetness to the tacos. I liked how the eggplant-ancho spread added a little heat to the dish and gave you another texture in each bite. We needed a side, so we made corn, which is in season now. Once it was finished cooking, we rolled it in cojita cheese, salt and pepper and each bite was sweet (from the corn) and savory (from the cojita). This recipe was a smash hit at the house, Lauren and I loved it. The tacos were light and fresh and you didn't miss the meat. We'll be making this dish again soon.